I wonder how Dawn Schafer feels about global warming. Probably good, huh? What's funny about this particular work of literary genius is that Scholastic must have felt Dawn came off as too much of a blowhard, because they nixed the haughty look of moral superiority on the new edition's cover. I don't know quite how I feel about that. I do know that - unless my eyes deceive me - they also repainted her shirt to achieve that California Casual Texas Tuxedo Look. For this, I'm sure we're all grateful. Plus, what does 'recycle conservation' even mean? Very mysterious, Schafer. Let's get this straight, folks: the first rule of the Baby-sitters Club is that you don't talk about the Baby-sitters Club (except for Chapter 3, in which you don't talk about anything but the Baby-sitters Club). Second rule is, if you follow my reference, the same as the first. But the THIRD rule - now that's the one where you aren't allowed to have any friends outside the Baby-sitters Club. This entry will be filed under the category of What Claudia Wore a Little But Mostly What Claudia's Wacky One-Book-Friend Ashley Wore. And yeah, Ashley's kind of wacky. She's obviously the child of seventies peaceniks who, even today, still have a vaguely illegal aroma emanating from them at all times. A.M.M. tries to attribute it (Ashley's outthereness) to the fact that Ashley went to the Keyes Art Society or something. I think a better explanation would be that Ashley found Papa Peacenik's stash and now spends her afternoons getting baked and painting pictures about the concept of effervescence or something. The new girl's clothes were the first thing to attract Claud's attention, of course. "They reminded me of something. What was it? Oh, yes. On television not long ago, I'd seen this bizarre movie called Woodstock. It was about a gigantic outdoor rock concert that took place ages ago, like in the sixties, and all the young people who attended it were what my parents call hippies. You know - they wore tons of beaded or silver jewelry and funny long skirts or bell-bottom jeans. The men pierced their ears and wore their hair in ponytails and the women looked like gypsies. (Only my mon said they were 'bohemian.' I think it means the same thing.)" I already love where this is going. "Well, this Ashford or whatever her name was [serious lols, but is Ashley really that uncommon a name? ], looked like a hippie. She was wearing a very pretty pink flowered skirt that was full and so long it touched the tops of her shoes - which I soon realized were not shoes, but sort of hiking boots. Her blouse, loose and lacy, was embroidered with pink flowers, and both her wrists were loaded with silver bangle bracelets. Her hair, which was almost as long as my friend Dawn's and was dirty blonde, was pulled into a fat braid (which, I might add [you might], was not held in place with a rubber band or anything; it just sort of trailed to an end). But the amazing thing was that because her hair was pulled back, you could see her ears. And she had three pierced earrings in each ear. They were all silver and all dangly, but none matched." Yuck, that is a lot of dangling silver. Claudia sighs over how lucky Ashley is, since the Conservative Kishis would never let Claudia have six holes. Who knew our girl was such a piercing enthusiast, damn. "I was wearing a very short pink cotton dress, white tights [I'm so soaked in Gossip Girl that my mind immediately went to Blair, and I'm not (that) ashamed to admit it], and black ballet slippers. I had swept all of my hair way over to one side, where it was held in place with a piece of pink cloth that matched the dress. Only one ear showed, and in it I had put my big palm tree earring." 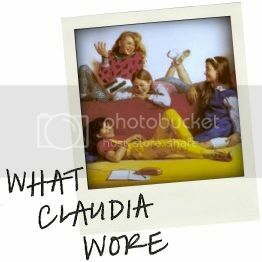 Claudia doesn't bother to describe Stacey's outfit (and why should she have to, really?) but she does throw us a bone and mention that Stacey'd "painted her fingernails yellow and then put black polka dots all over them." I really hate polka dots. "There she was. She was wearing a puffy white blouse, a blue-jean jacket, a long blue-jean skirt, and those hiking boots again. Beaded bracelets circled both wrists, and she'd tied a strip of faded denim around her head, like an Indian headband." Nicole Richie circa 2005. Am I wrong? Okay, she probably wouldn't have rocked the Texas tuxedo, but you KNOW you saw that outfit hanging off her bony little frame at one point. When Claud's art teacher announces that first prize winner in the art show will receive $250 dollars, Claudia can't even begin to think of how she'd spend it. So I decided to extrapolate a bit: I've created a shopping list, complete with creative spelling decisions a la Kishi. 4. royle blue acid wash pants. lol hipstrs. Later in book, in the midst of Claudia's Girlcrush, she notes for the reader that Ashley is wearing "two gold balls and a hoop in one ear. A seashell, a real feather, and a dangly flamingo in the other. Pretty cool." I will begrudgingly admit that doesn't sound too terribly horrendous. And then, Claudia's love begins to wane. "Then I turned around and nearly ran into Ashley. She was wearing a long, all-the-way-to-her-ankles dress with three rows of ruffles at the bottom. A strip of black cloth was tied around her head. I couldn't see her earrings, but she looked . . . well, all right, I'll admit it. She looked a little bizarre." "Kristy scowled at me, and I knew why. Ashley looked just plain weird in her outfit - a long knitted vest over an even longer shirt which she was wearing tails-out over a skirt that didn't match either the vest or the skirt. [Huh? Pay attention, Ann. I guess on the last page she just stops caring.] And there were those hiking boots again." Kristy needs to step off. Ashley is just expressing all the colors within her, the ebb and flow of her immortal spirit. Quit hating. By the way, y'all folks (I was recently visiting my cousins in Louisville) need to thank Bethany from OIT for this entry, because she is the main reason I'm even updating. I had a very surreal encounter with her which began with her asking if I was the girl who wrote [this blog] and ended with me being called a celebrity multiple times, which I did NOT have a problem with. So hats off to Bethany! And finally, if you are interested in reading a little more about me and my thoughts on the blog, The Phoenix writer Caitlin Curran recently did a short piece on What Claudia Wore. I was NOT aware they were going to use this picture. Now all The Phoenix's readers know that I am the shameful owner of a dirty bathroom mirror.